Sakuma Point is an unprepossessing park along Boat Street, near the University of Washington. Not quite half an acre in size, the park is sandwiched by a popular restaurant and canoe rental shop on the left, and a storage warehouse on the right. Visitors can sit at a bench or table overlooking a small stretch of Portage Bay and relax or eat their lunch. Or, if you are Charlie Wright, you count birds for ten minutes. Yes, hard as it may be to believe, Charlie—COASST’s stalwart data verifier, he who scrutinizes almost every single photo volunteers send in—likes live birds too. A lot. “I’ve been watching birds in general pretty much since I started having memories,” he says. 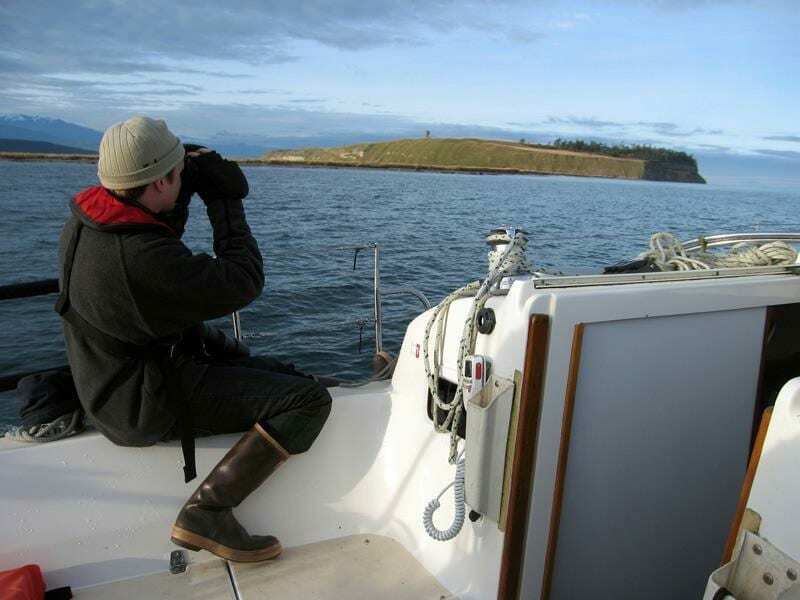 He was leading birding trips for the Rainier Audubon Society in southern King County by the age of eleven, and has done field work with birds all over the world, from Alaska to Peru. A few years ago, he was part of a team that drove all over Washington, ultimately breaking the state record for greatest number of species seen in a twenty-four-hour period. “Birds are kind of my muse,” he says. 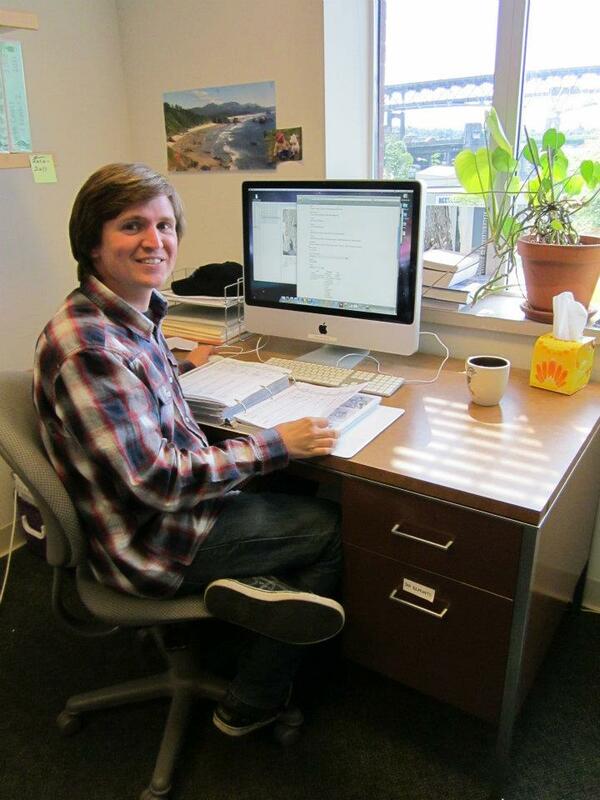 Charlie started as the COASST data verifier in 2010. He performs the vital function of confirming the identity of every dead bird COASSTers find on their surveys. Each fall, he starts to work his way through the backlog of volunteer submissions from the previous year. Most of the time he has no reason to doubt what a volunteer sends in: he cross-references the datasheet with the photos and concurs with the ID. It takes him all of thirty seconds, tops. “It’s rare for me to spend more than five minutes on anything,” he says. “COASST volunteers are pretty amazing at IDs. They know their birds and how to use the COASST field guide.” In fact, COASSTers correctly identify beached birds to species 89% of the time. 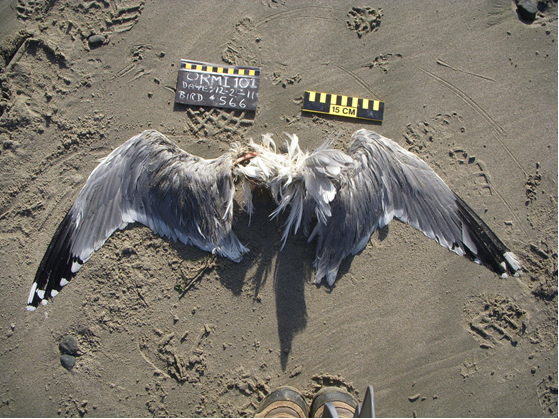 This entry was posted in Staff Profile and tagged Alaska, beached birds, Citizen Science, Conservation, Data, Seabird on July 3, 2018 by coasst. 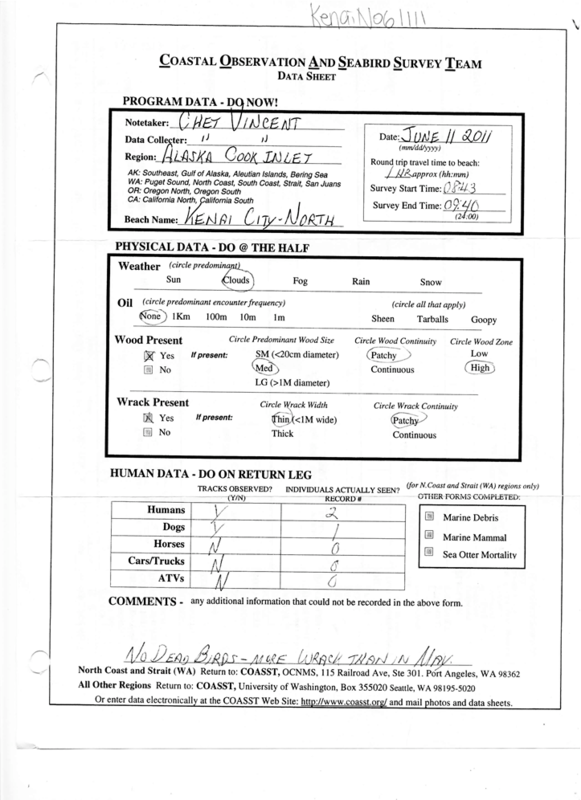 COASST data depend on two things: detailed notes and high-quality photographs. So we (Scott, Jessica and An, students with COASST) went digging! Thanks to some great examples sent in by COASSTers, we’ve compiled some helpful tips. Good notes are legible and complete. If a space in the data sheet asks for information pertaining to something not present or not applicable to the situation, put a slash (/) in the box, a “N/A” for not applicable, or a “U” for unknown (can’t be determined). “N” means no, “0” means none. When a survey sheet is returned with all the boxes filled, we know it’s complete. 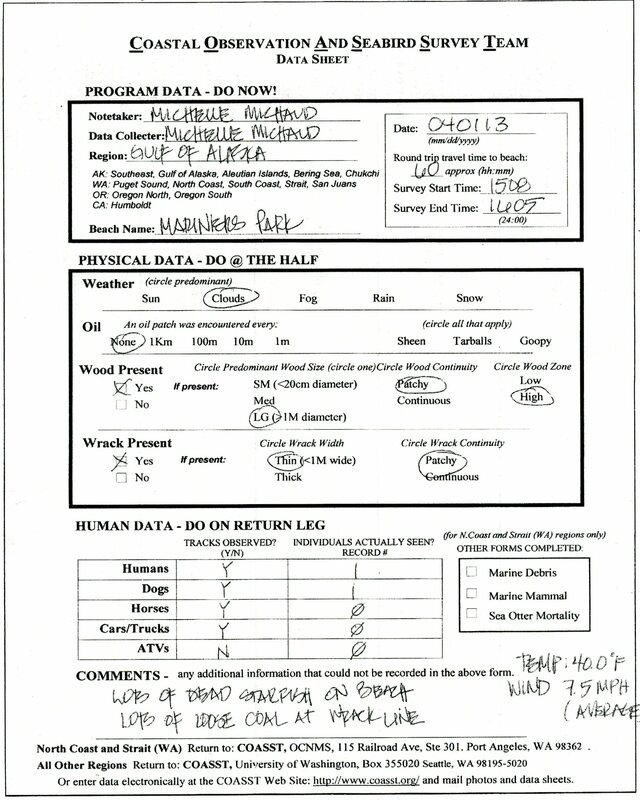 Data example 1: Paul’s data sheet. Note how paul has filled in all the appropriate boxes legibly. Data example 2: Chet’s data sheet. Note Chet’s comment at the bottom of the survey – this way we can be doubly sure someone didn’t just forget to fill out the backside. 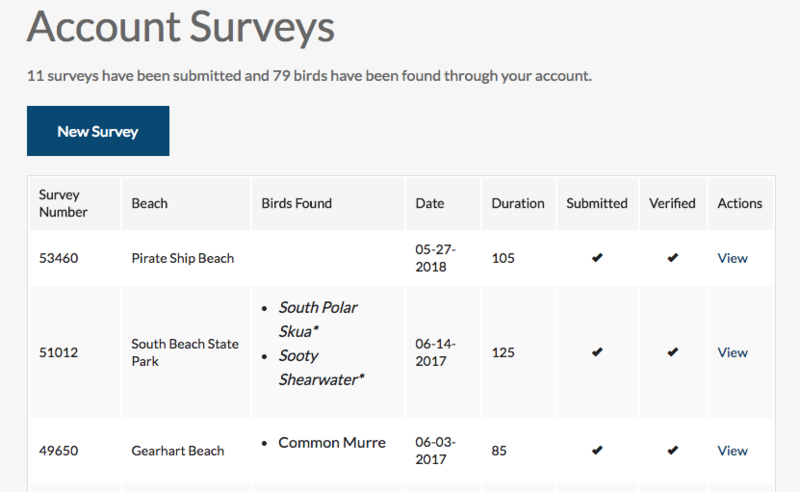 Data example 4: Bird data from Cindy on Mad River Park North (Humboldt region). 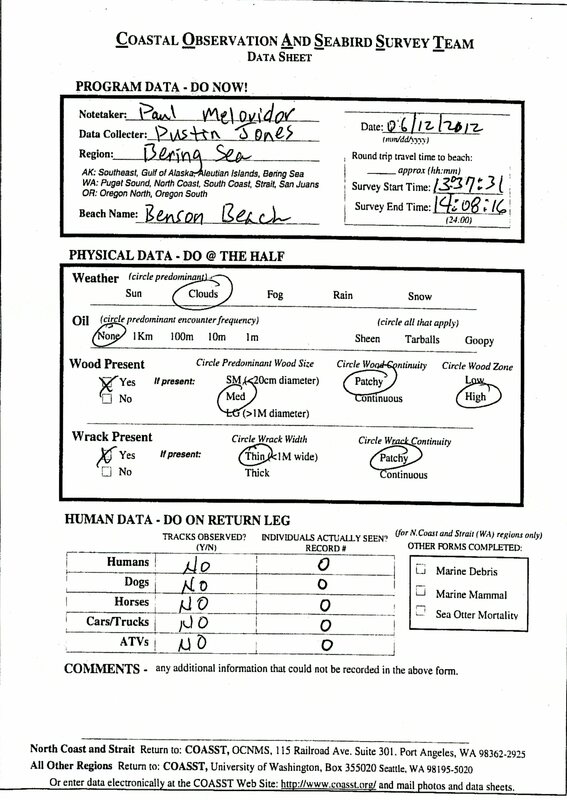 Note how all boxes are complete, a dash fills the second to last box noting that there is no distinguishable difference between Brown Pelican males and females. 2) and 3) above are found in each COASST volunteer toolbox, 1) you’ll have to find on your own! Photo example 1: Jerry & Carol’s murre on Bastendorff (Oregon South region). Slate/chalkboard is complete, bird is in the sun, shadows are minimal, bird takes up almost entire frame, camera is positioned over bird (not at sand-level or weirdly angled, for instance). Photo example 2: Mariann & Doug’s gull photographed on Oregon Mile 101 (Oregon South region). Photo has scale, chalkboard is neatly filled out, light is good, shadows minimized, wings are spread and take up most of the frame. 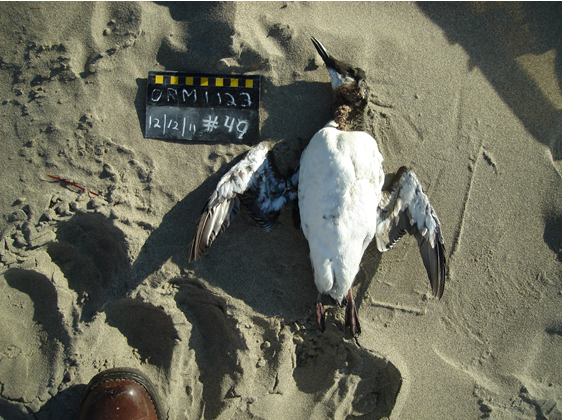 This entry was posted in Uncategorized and tagged Alaska, Data, Oregon, Seabird, Volunteer on July 24, 2013 by coasst.